Founded in 2006 by French designers Marielle Baldelli and Sébastien Messerschmidt, E-Glue is one of the few studios that specializes in graphic design, interior design, illustration and decoration for kids. 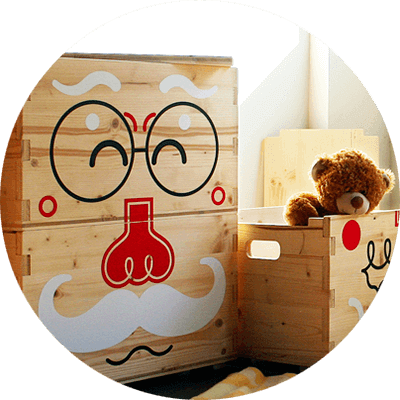 In 2006, E-Glue launched its own-brand products by developing a first collection of giant wall stickers for kids, largely relayed by the press and sold throughout the world. All our wall stickers and decals are co-designed and handmade in our workshop from premium materials (source : France and Germany), therefore ensuring a great customer service and high quality finish from design to product then secure packaging to delivery. Since then, new baby and kid's products have been designed to expand our brand's distinctive universe and offer a complete range of nursery and children's room decorations for creating their dream space. Our designs and products are known for their simple shapes and refined appearance, especially well-adapted to kids rooms. They are made to order within a few days or allow small series production, so as to give priority to customization, craftsmanship, high quality material, design and originality. We often work in collaboration with Living Heritage companies to use, try to modernize and maintain a know-how as best as possible. Discover our designs and collections of original wall decors, furniture, baby nursery and kids room decor accessories : themed packs of wall decals for baby room, large customized kids wall stickers, wall art and limited edition art prints for children's room, posters, colorful wallpapers, custom wall murals, borders, textile furnishings, cushions, blankets, soft toys, lightings, storage boxes and more ... for a modern baby nursery and children's room both stylish and fun ! We offer products and services to individuals, through our online store for kids, as well as to professionals, such as architects and interior design agencies, public institutions (childcare centres, hospitals and clinics for children, pediatric services, schools, kids camps, leisure centres, day nurseries, cultural centers) and private companies (medical practices, doctors surgeries, dentists and orthodontists, pediatricians, hotels, shops for kids, children's foundation, private day nurseries, sports centres, kids clubs). best kid's room decor ideas and photos You don't follow us on Instagram ? That's a pity... Here are some baby nursery and kids room decor ideas with our client photos !